On December 1st, PROTEUS participated in the Ict4water cluster meeting dedicated to roadmaps definition of water services. 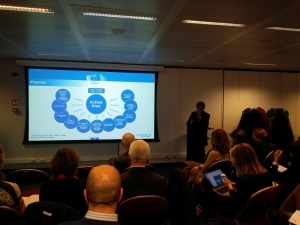 Held in Brussels, this workshop intended to present the Action Plan 2017 where PROTEUS contributed in, identifying actions which include activities, challenges, timelines and tools for implementation to suggest the creation of the Digital Single Market for Water Services. Gathering NGOs, water industry, researchers, SMEs, ICT companies, water utilities/municipalities as well as EU officials, the action plan browse key challenges to succeed in building a fully integrated smart water network in Europe, identifying the main gaps and challenges that need to be addressed in the future development of the Smart Water Sector: Big Data, IoT, Smart Objects, Data Infrastructures, Links with Smart Cities, Water-food-energy nexus, Circular Economy, Interoperability, Standardization… The report proposes a technology roadmap, which suggests the creation of a borderless Digital Single Market for water services to foster the transition of ICT technologies in water sector from pilot scale to wide market uptake.